This article is about the facility for ships. For other uses, see Port (disambiguation). 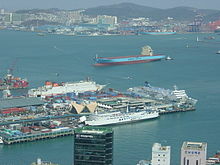 Port of Busan, Korea. Two Maersk vessels can be seen in the background. Today, by far the greatest growth in port development is in Asia, the continent with some of the world's largest and busiest ports, such as Singapore and the Chinese ports of Shanghai and Ningbo-Zhoushan. Whenever ancient civilisations engaged in maritime trade, they tended to develop sea ports. One of the world's oldest known artificial harbors is at Wadi al-Jarf on the Red Sea. Along with the finding of harbor structures, ancient anchors have also been found. 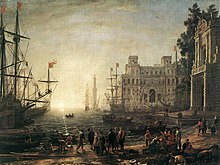 Other ancient ports include Guangzhou during Qin Dynasty China and Canopus, the principal Egyptian port for Greek trade before the foundation of Alexandria. 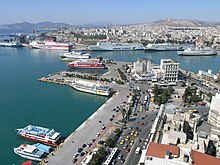 In ancient Greece, Athens' port of Piraeus was the base for the Athenian fleet which played a crucial role in the Battle of Salamis against the Persians in 480 BCE. In ancient India from 3700 BCE, Lothal was a prominent city of the Indus valley civilisation, located in the Bhāl region of the modern state of Gujarāt. Ostia Antica was the port of ancient Rome with Portus established by Claudius and enlarged by Trajan to supplement the nearby port of Ostia. In Japan, during the Edo period, the island of Dejima was the only port open for trade with Europe and received only a single Dutch ship per year, whereas Osaka was the largest domestic port and the main trade hub for rice. Nowadays, many of these ancient sites no longer exist or function as modern ports. Even in more recent times, ports sometimes fall out of use. Rye, East Sussex, was an important English port in the Middle Ages, but the coastline changed and it is now 2 miles (3.2 km) from the sea, while the ports of Ravenspurn and Dunwich have been lost to coastal erosion. Whereas early ports tended to be just simple harbours, modern ports tend to be multimodal distribution hubs, with transport links using sea, river, canal, road, rail and air routes. Successful ports are located to optimize access to an active hinterland, such as the London Gateway. Ideally, a port will grant easy navigation to ships, and will give shelter from wind and waves. Ports are often on estuaries, where the water may be shallow and may need regular dredging. Deep water ports such as Milford Haven are less common, but can handle larger ships with a greater draft, such as super tankers, Post-Panamax vessels and large container ships. Other businesses such as regional distribution centres, warehouses and freight-forwarders, canneries and other processing facilities find it advantageous to be located within a port or nearby. Modern ports will have specialised cargo-handling equipment, such as gantry cranes, reach stackers and forklift trucks. Ports usually have specialised functions: some tend to cater mainly for passenger ferries and cruise ships; some specialise in container traffic or general cargo; and some ports play an important military role for their nation's navy. Some third world countries and small islands such as Ascension and St Helena still have limited port facilities, so that ships must anchor off while their cargo and passengers are taken ashore by barge or launch (respectively). In modern times, ports survive or decline, depending on current economic trends. In the UK, both the ports of Liverpool and Southampton were once significant in the transatlantic passenger liner business. Once airliner traffic decimated that trade, both ports diversified to container cargo and cruise ships. Up until the 1950s the Port of London was a major international port on the River Thames, but changes in shipping and the use of containers and larger ships, have led to its decline. Thamesport, a small semi-automated container port (with links to the Port of Felixstowe, the UK's largest container port) thrived for some years, but has been hit hard by competition from the emergent London Gateway port and logistics hub. In mainland Europe, it is normal for ports to be publicly owned, so that, for instance, the ports of Rotterdam and Amsterdam are owned partly by the state and partly by the cities themselves. By contrast, in the UK all ports are in private hands, such as Peel Ports who own the Port of Liverpool, John Lennon Airport and the Manchester Ship Canal. Even though modern ships tend to have bow-thrusters and stern-thrusters, many port authorities still require vessels to use pilots and tugboats for manoeuvering large ships in tight quarters. For instance, ships approaching the Belgian port of Antwerp, an inland port on the River Scheldt, are obliged to use Dutch pilots when navigating on that part of the estuary that belongs to the Netherlands. Ports with international traffic have customs facilities. The terms "port" and "seaport" are used for different types of port facilities that handle ocean-going vessels, and river port is used for river traffic, such as barges and other shallow-draft vessels. 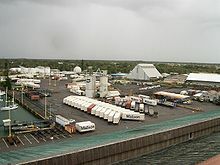 A dry port is an inland intermodal terminal directly connected by road or rail to a seaport and operating as a centre for the transshipment of sea cargo to inland destinations. A fishing port is a port or harbor for landing and distributing fish. It may be a recreational facility, but it is usually commercial. A fishing port is the only port that depends on an ocean product, and depletion of fish may cause a fishing port to be uneconomical. An inland port is a port on a navigable lake, river (fluvial port), or canal with access to a sea or ocean, which therefore allows a ship to sail from the ocean inland to the port to load or unload its cargo. An example of this is the St. Lawrence Seaway which allows ships to travel from the Atlantic Ocean several thousand kilometers inland to Great Lakes ports like Toronto, Duluth-Superior, and Chicago. 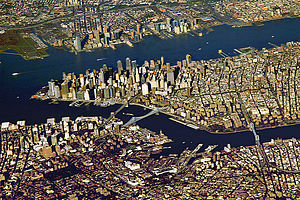 A seaport is further categorized as a "cruise port" or a "cargo port". Additionally, "cruise ports" are also known as a "home port" or a "port of call". The "cargo port" is also further categorized into a "bulk" or "break bulk port" or as a "container port". Cargo ports, on the other hand, are quite different from cruise ports, because each handles very different cargo, which has to be loaded and unloaded by very different mechanical means. The port may handle one particular type of cargo or it may handle numerous cargoes, such as grains, liquid fuels, liquid chemicals, wood, automobiles, etc. Such ports are known as the "bulk" or "break bulk ports". Those ports that handle containerized cargo are known as container ports. Most cargo ports handle all sorts of cargo, but some ports are very specific as to what cargo they handle. Additionally, the individual cargo ports are divided into different operating terminals which handle the different cargoes, and are operated by different companies, also known as terminal operators or stevedores. A cruise home port is the port where cruise ship passengers board (or embark) to start their cruise and disembark the cruise ship at the end of their cruise. It is also where the cruise ship's supplies are loaded for the cruise, which includes everything from fresh water and fuel to fruits, vegetables, champagne, and any other supplies needed for the cruise. "Cruise home ports" are very busy places during the day the cruise ship is in port, because off-going passengers debark their baggage and on-coming passengers board the ship in addition to all the supplies being loaded. Currently, the Cruise Capital of the World is the Port of Miami, Florida, closely followed behind by Port Everglades, Florida and the Port of San Juan, Puerto Rico. A port of call is an intermediate stop for a ship on its sailing itinerary. At these ports, cargo ships may take on supplies or fuel, as well as unloading and loading cargo while cruise liners have passengers get on or off ship. A warm-water port is one where the water does not freeze in wintertime. Because they are available year-round, warm-water ports can be of great geopolitical or economic interest. Such settlements as Dalian in China, Vostochny Port, Murmansk and Petropavlovsk-Kamchatsky in Russia, Odessa in Ukraine, Kushiro in Japan and Valdez at the terminus of the Alaska Pipeline owe their very existence to being ice-free ports. 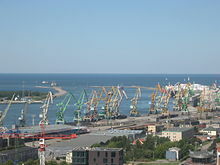 The Baltic Sea and similar areas have ports available year-round beginning in the 20th century thanks to icebreakers, but earlier access problems prompted Russia to expand its territory to the Black Sea. There are several initiatives to decrease negative environmental impacts of ports. These include SIMPYC, the World Ports Climate Initiative, the African Green Port Initiative and EcoPorts. The busiest port in Africa is Port Said in Egypt. 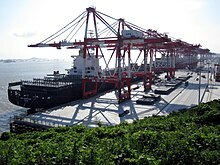 The port of Shanghai is the largest port in the world in both cargo tonnage and activity. It regained its position as the world's busiest port by cargo tonnage and the world's busiest container port in 2009 and 2010, respectively. It is followed by the ports of Singapore and Hong Kong, both of which are in Asia. 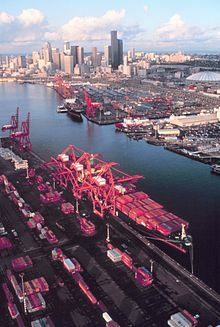 Europe's busiest container port and biggest port by cargo tonnage by far is the Port of Rotterdam, in the Netherlands. It is followed by the Belgian Port of Antwerp or the German Port of Hamburg, depending on which metric is used. In turn, the Spanish Port of Valencia is the busiest port in the Mediterranean basin. The largest ports include the ports of Los Angeles and South Louisiana in the U.S., Manzanillo in Mexico and Vancouver in Canada. Panama also has the Panama Canal that connects the Pacific and Atlantic Ocean, and is a key conduit for international trade. The largest port in Australia is the Port of Melbourne. According to ECLAC's "Maritime and Logistics Profile of Latin America and the Caribbean", the largest ports in South America are the Port of Santos in Brazil, Cartagena in Colombia, Callao in Peru, Guayaquil in Ecuador and the Port of Buenos Aires in Argentina. ^ Rossella Lorenzi (12 April 2013). "Most Ancient Port, Hieroglyphic Papyri Found". Discovery News. Retrieved 21 April 2013. ^ "Welcome". London Thamesport. Retrieved 6 September 2018. 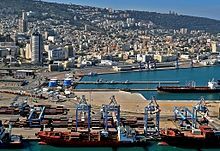 ^ "Feasibility Study on the network operation of Hinterland Hubs (Dry Port Concept) to improve and modernise ports' connections to the hinterland and to improve networking" (PDF). InLoc. January 2007. Archived from the original (PDF) on 2008-04-13. Retrieved 2008-03-10. ^ "World Port Rankings 2011" (PDF). Agência Nacional de Transportes Aquaviários. Antaq, Brazil. 2011. Retrieved 6 September 2018. ^ "Los 10 mayores puertos de América Latina y Caribe en tráfico de contenedores". Revista de Ingeniería Naval (in Spanish). Madrid, Spain: Asociación de Ingenieros Navales y Oceánicos de España. September 28, 2016. Retrieved May 3, 2017. Antunes, Cátia: Early Modern Ports, 1500-1750, European History Online, Mainz: Institute of European History, 2011, retrieved: November 2, 2011.